Representatives of our U.S. Armed Forces got a tremendous send off from Jaguar Land Rover in Long Island, New York before they depart for the 2017 Invictus Games in Toronto. The Invictus Games is an international sports competition for injured, wounded, and ill service members. Jaguar Land Rover is a Presenting Partner of the Invictus Games. Jaguar Land Rover has been a supporter of the U.S. Armed Forces team since 2014 for the Inaugural Games in London and the Orlando Games in 2016. This year a new event for the Games is the Jaguar Land Rover Driving Challenge. The U.S. Team is comprised of 80 athletes and gathered in Long Island for practice and scrimmages. The Games take place this month from September 23 to September 30 in Toronto, Canada. Jaguar Land Rover organized the send-off celebration in honor and nonrecognition of the athletes as they go against teams from 13 other nations. “The Invictus Games is an amazing event as it brings together wounded warriors from all around the world to compete, share stories and encourage each other. 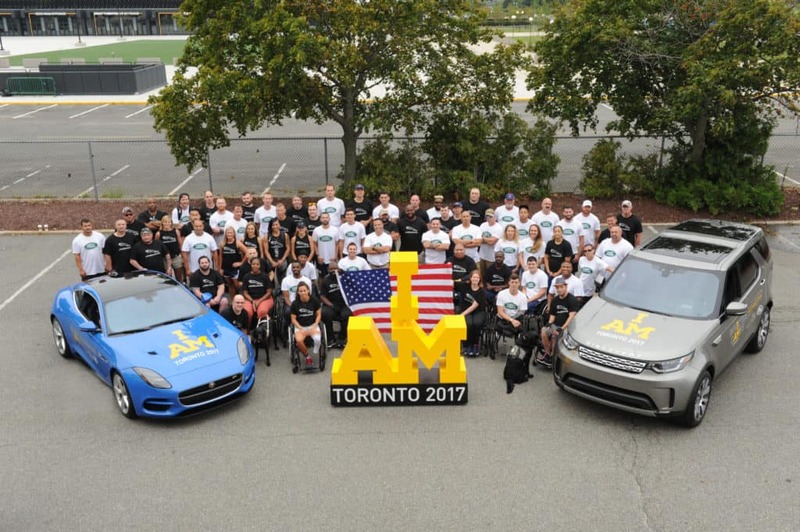 We want to thank Jaguar Land Rover for all of their support before and during the games,” said U.S. Armed Forces Team Captain for Invictus Games Toronto 2017, United States Air Force, Capt. Christy Wise. The U.S. Team is made up of veterans or active-duty service men and women from across the country who will compete in all 12 adaptive sports. These sports cover a vast range of competition challenges. Archery, indoor rowing, power lifting, road cycling, sitting volleyball, swimming, track and field, wheelchair basketball, wheelchair rugby, golf, and the Jaguar Land Rover Driving Challenge. Land Rover Colorado Springs, as part of the Red Noland Auto Group is a proud support of all of our military in Colorado. We are most of all proud to be part of the Jaguar Land Rover dealerships and it’s support of the U.S. Armed Forces Team at the 2017 Invictus Games.